Read all these instructions before using this product. The wires as to:yellow/green to ground,brown to hot,blue to neutral. Wires come with 5-12inches,you can lengthen it yourself ,according to your requirement. It comes with a metal bracket on the lamp body, allowing you to install the light flexibly, including ceiling-mounted, wall-mounted, and ground-mounted.? Replace 250W halogen bulb by 50W LED. 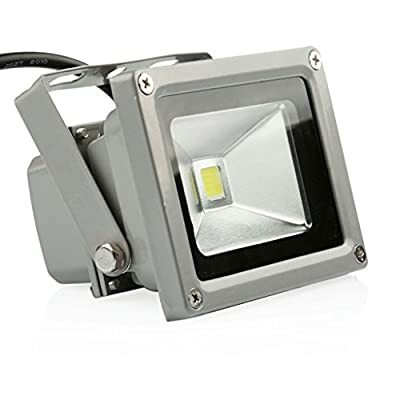 Save 80% on electricity bill of lighting Provides even and bright illumination across 120 degree wide beam angle Waterproof IP65,applications: garden, piazza, bill boards, factory, gyms, docks and other place where flood lighting are needed. Extremely 50000 hours long life reduces re-lamp frequency. Save labor cost to replace bulbs with short lifespan. Note:The length of cord is 8-12 inches. Brown is fire wire, blue is common wire, yellow is ground wire. Plug not include.